Aim: To investigate the expression of polymeric immunoglobulin receptor (pIgR) in endometrial adenocarcinoma and the relationship between pIgR and the clinicopathological features of endometrial adenocarcinoma. To investigate the role of pIgR in the biological behavior of endometrial adenocarcinoma cell lines. Methods: First, the paraffin-embedded endometrial adenocarcinoma samples and clinicopathological data from the Chao-Yang Hospital were collected. Next, immunohistochemistry was conducted to test the expression of pIgR in endometrial adenocarcinoma; the correlations between pIgR and clinicopathological features were detected. Then, the expression of pIgR in the Ishikawa cells was interfered with short-interfering RNA (siRNA). Finally, the migration and proliferation abilities of Ishikawa cells were detected by transwell and CCK8 assays before and after interference. Results: pIgR had a high expression level and higher H-score in endometrial adenocarcinoma (P = 0.013) than in noncancerous tissues. There was no correlation between pIgR and the histopathological features of endometrial adenocarcinoma (P ≥ 0.418). The migration ability of Ishikawa cells was increased after interference with pIgR (P = 0.023). The proliferation of Ishikawa cells was not different between the untreated and siRNA215-treated groups (P = 0.967). Conclusion: PIgR may be a predictive biomarker of endometrial adenocarcinoma and a potential target protein for immunotherapy of endometrial adenocarcinoma. Polymeric immunoglobulin receptor (pIgR) is a member of the immunoglobulin (Ig) superfamily. It mediates the transfer of IgA,, and IgM, antibodies across mucosal and glandular epithelia. PIgR expresses on the apical and lateral areas of cytoplasm and membrane, occasionally accumulates within the lumen of glands. In addition to its role in inflammatory response and immune defense,,, pIgR has been reported to abnormally express in some cancers. For example, in patients with adenocarcinoma of the upper gastrointestinal tract, high pIgR expression leads to a decreased risk of recurrence and improved survival. PIgR is downregulated in the nasopharyngeal carcinoma cells, but it has higher expression levels in the normal epithelial cells. PIgR shows low expression level in lung carcinoma, and low expression of pIgR is correlated with well-differentiated cancer. In contrast, pIgR is highly expressed in early-stage hepatocellular carcinoma, and its high expression level is statistically associated with the early recurrence of carcinoma. Currently, the clinical relevance and potential function of pIgR in endometrial adenocarcinoma remain uncertain. The objectives of this study were to investigate the expression of pIgR in endometrial adenocarcinoma, the relationship between pIgR and clinicopathological features of endometrial adenocarcinoma, and the role of pIgR in the biological behavior of endometrial adenocarcinoma cell lines. Endometrial adenocarcinoma samples from 70 patients were assembled into tissue microarrays. These patients had received neither prior medical treatment nor radiotherapy for cancer. 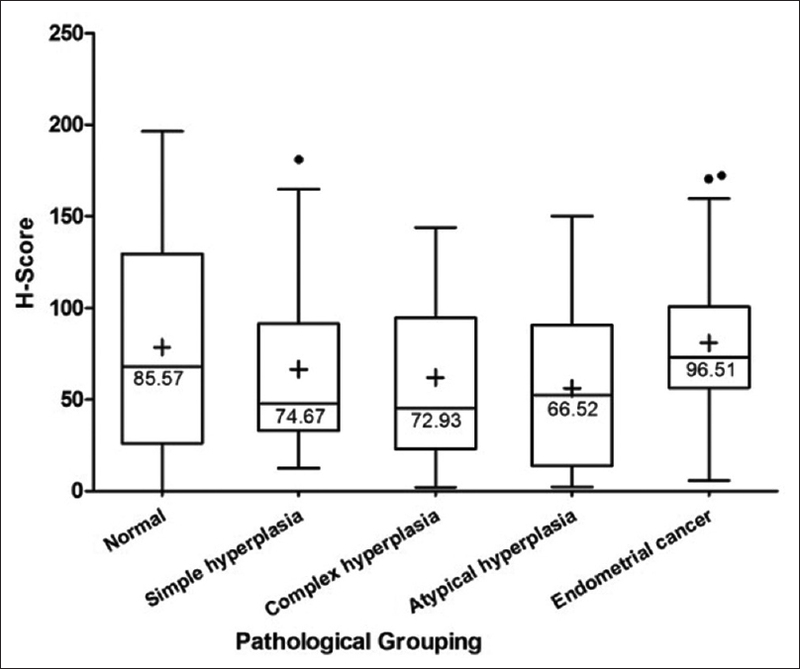 The normal endometrial, simple hyperplasia endometrial, complex hyperplasia endometrial, and atypical hyperplasia endometrial samples were from 22, 23, 21, and 26 patients, respectively. These samples were prepared from paraffin blocks obtained from the Pathology Department at the Beijing Chao-Yang Hospital of Capital Medical University. The patients' clinicopathological data were retrospectively achieved from the Department of Obstetrics and Gynecology of Beijing Chao-Yang Hospital. The endometrial adenocarcinoma cell line was the Ishikawa cell line purchased from the American Type Culture Collection (Manassas, VA, USA). After blocking endogenous peroxidase activity, the paraffin sections were incubated overnight at 4°C with antihuman pIgR polyclonal rabbit IgG (dilution, 1:200; polyclone, ab96196 Abcam, USA). The specificity of this antibody had been confirmed by Western blotting and immunofluorescence (http://www.abcam.cn/pigr-antibody-ab96196.html). The secondary antibody biotinylated goat antirabbit IgG (dilution, 1:200; A0545; Sigma-Aldrich; Merck Millipore) was applied at room temperature for 30 min before washing in phosphate-buffered saline (PBS). Next, the samples were incubated with streptavidin-biotin antibodies that were conjugated with horseradish peroxidase (dilution, 1:300; A0185; Sigma-Aldrich; Merck Millipore) for 10 min. The DAB Detection Kit (Maixin Biotech Co., Ltd.) was used for staining. According to the suppliers' instruction, the Ishikawa cells were cultured in RPMI-1640 medium (Invitrogen; Thermo Fisher Scientific, Inc.) supplemented with 10% fetal bovine serum (Invitrogen; Thermo Fisher Scientific, Inc.). Then, the cells were seeded in 25 cm2 cell culture bottles and cultivated in a humidified incubator at 37°C with 5% CO2. The cells in the exponential phase were used in the following experiments. To obtain stable transfection, the Ishikawa cells were grown to 50%–60% culture confluency in six-well plates and then transfected with 0.04 optical density of pIgR short-interfering RNA (siRNA) in 5 μl of lipofectamine 2000 (Invitrogen), according to the manufacturer's instructions. GenePharma (Suzhou, China) synthesized three siRNA sequences targeting human pIgR [Table 1], including PIGR-homo1537 (siRNA15), PIGR-homo716 (siRNA7), PIGR-homo637 (siRNA6), and a nontargeting control siRNA. The total protein was extracted from the cells treated with siRNA and the control cells with RIPA buffer. The protein levels were measured by a protein quantitative analysis kit (BCA Protein Assay, Boster Biological Technology, Wuhan, China). Then, the extracted proteins (30 μl per sample) were subjected to 10% SDS-Tris glycine gel electrophoresis and run at 130 V for 2 h before being transferred to the polyvinylidene fluoride membrane (EMD Millipore, Billerica, MA, USA). After blocking with 5% bovine serum albumin (BSA) (1.5 g albumin bovine V + 30 ml PBS with Tween 20 [PBST]; Gibco Life Technologies, USA), the membrane was incubated at room temperature for 2 h. Next, the bands were incubated overnight at 4°C in BSA with the primary antibody against pIgR, polyclonal rabbit IgG (dilution, 1:1000; ab96196, Abcam, UK), and mouse monoclonal antibody (dilution, 1:1000; Cell Signaling Technology, Inc.) against glyceraldehyde-3-phosphate dehydrogenase (GAPDH). GAPDH was used as an internal control. After washing three times with PBST, the bands were incubated with the secondary antibody labeled with horseradish peroxidase (dilution, 1:3000; Cell Signaling Technology, Inc.) at room temperature for 2 h. Finally, the bands were visualized with an enhanced chemiluminescent substrate kit (Pierce, Thermo Fisher Scientific, Inc.) with the Bio-Rad system installed with Image Lab software (Bio-Rad Laboratories, Inc.). The experiment was repeated three times, and the results were similar across all three repetitions. The cell migration assay was performed with transwell chambers. The cells treated with siRNA (50,000 cells per well) and the control cells (50,000 cells per well) were added to the top chambers of the 24-well transwell plate (8 μm; Corning Costar Corp., Corning, NY, USA). After 24 h, the filters were gently washed with ddH2O, and the cells that had not migrated but had remained at the top of the filter were removed. Then, the migrated cells were fixed with paraformaldehyde (4%) and stained with crystal violet (0.2%) for 20 min. Finally, the migrated cells were observed under the microscope and counted. This assay was also repeated three times. The cells treated with siRNA (3000 cells per well) and the control cells (3000 cells per well) were cultured in a 96-well plate. A volume of 10 μl of Cell Counting Kit-8 solution (Dojindo Molecular Technologies, Inc., Japan) was added to each well, and the cells were incubated for 4, 24, 48, and 72 h. The proliferative ability of the cells was measured by inspecting the absorbance of each well at 450 nm with the Multiskan Spectrum Microplate Reader (Thermo Fisher Scientific, USA). This test was repeated three times, and each sample was replicated in quadruplicate each time. The statistical analyses were all performed with SPSS software (Version 17.0). The data regarding cell proliferation and migration assay were analyzed with GraphPad Prism software (Version 6.01). The immunohistochemical (IHC) data and clinicopathological parameters were analyzed with Fisher's exact test, nonparametric tests, and two-tailed Chi-square tests. All the statistical analyses were two-sided, and P < 0.05 was considered statistically significant. 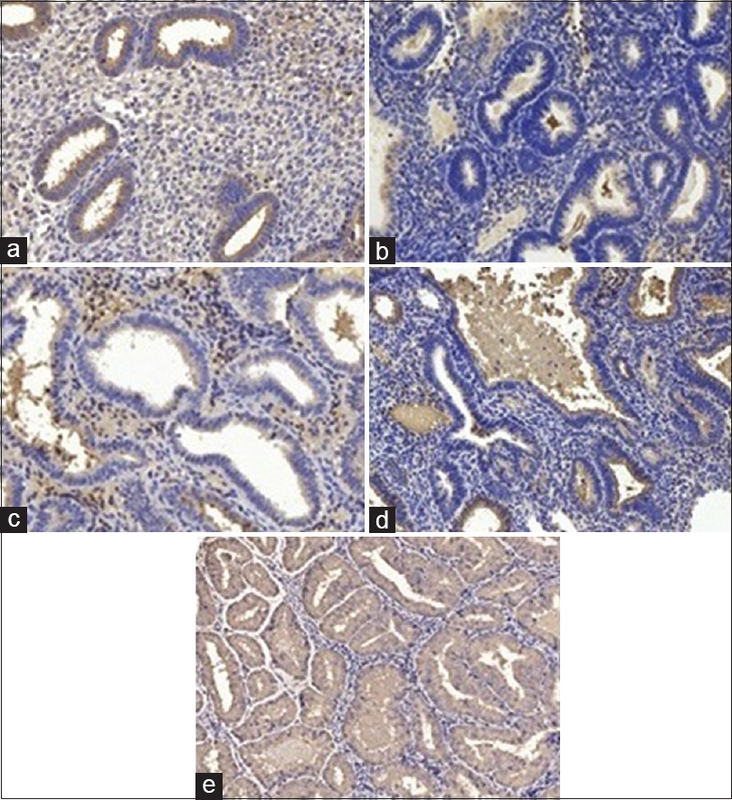 PIgR had a high expression level in endometrial adenocarcinoma [Figure 1] and [Figure 2]. The H-score of pIgR in endometrial adenocarcinoma was higher than that in other tissue [Figure 3]. 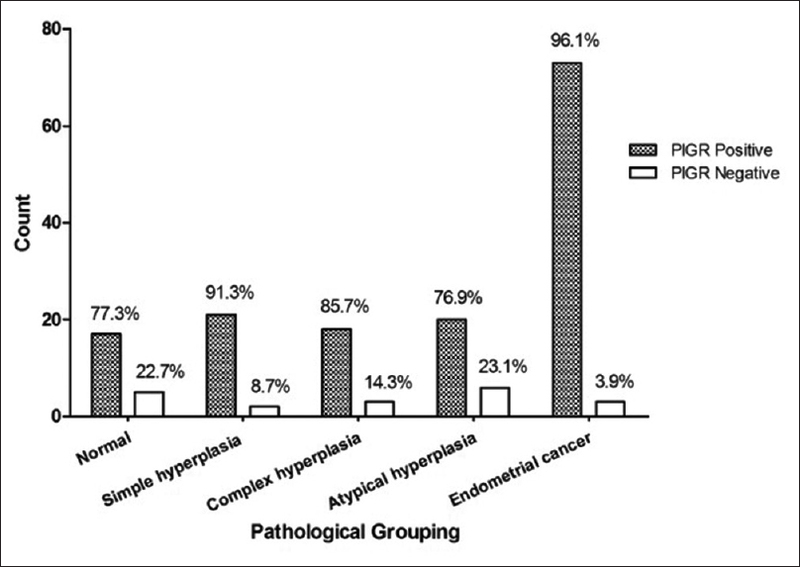 The associations between pIgR and different clinicopathological characteristics of patients are shown in [Table 2]. The distributions of pIgR among groups were not different in terms of the International Federation of Gynecology and Obstetrics (FIGO) stage, depth of invasion, lymphatic metastasis, tissue transfer, vascular cancer, and tumor grade (P > 0.05). 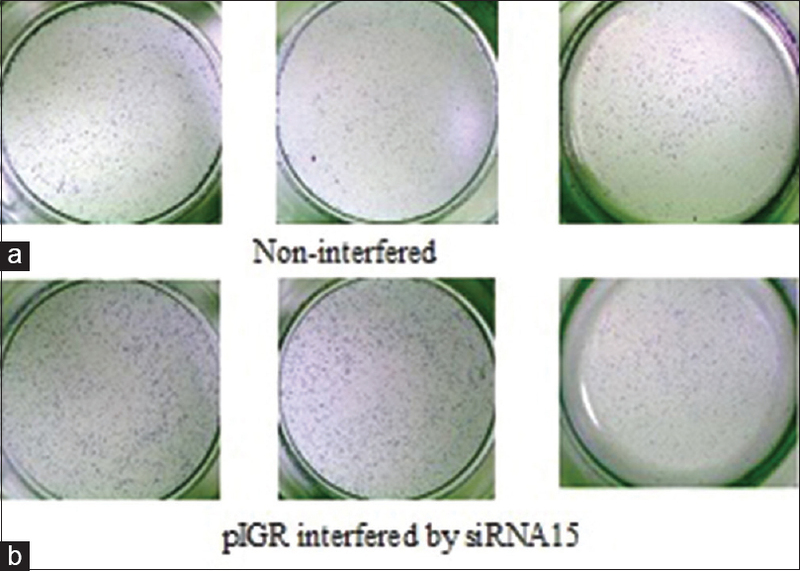 Western blotting showed that the three pIgR siRNAs had different effects. 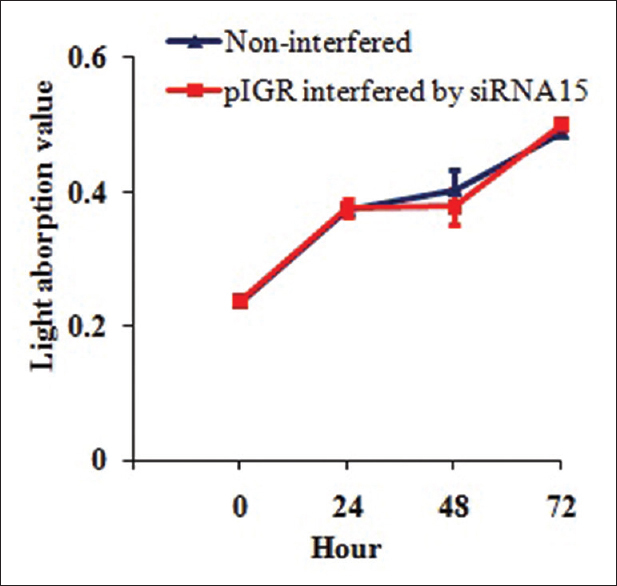 siRNA15 showed the most substantial impact on pIgR of the three siRNAs [Figure 4]. The transwell assay was performed in triplicate to determine whether pIgR contributed to the migration of Ishikawa cells [Figure 5]. 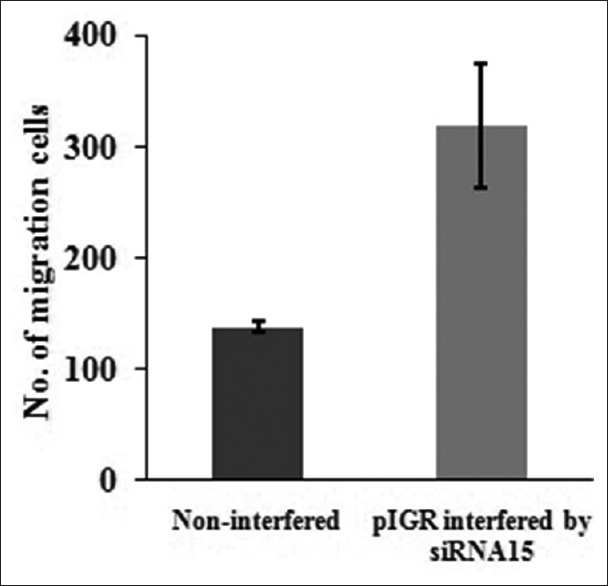 The number of migrated Ishikawa cells significantly increased after interference with pIgR by siRNA15 compared with cells not treated with siRNA15 [Figure 6]. To test whether pIgR influenced tumorigenesis, CCK8 assay was performed to detect the proliferation of untreated and siRNA15-treated Ishikawa cells. The result showed that there was no significant difference in the proliferation of untreated and siRNA15-treated Ishikawa cells at 24, 48, and 72 h [Figure 7]. Endometrial carcinoma is one of the most common female genital tract malignancies., The traditional therapies for endometrial carcinoma, including surgery, radiotherapy, chemotherapy, and hormonotherapy, have limited efficacy for those patients with advanced and recurrent carcinoma. Alternative treatments for endometrial carcinoma are needed. In recent years, researchers have paid more attention to the study of immunotherapy and molecular therapy for malignant tumors. It is critical to identify highly expressed biomarkers of tumors. The primary objective of this study was to test the expression level of pIgR in endometrial carcinoma. PIgR has been suggested as a cancer biomarker in many studies. In some tumors, including but not limited to those of the upper gastrointestinal tract and hepatocellular carcinoma,, the expression of pIgR is increased, while in other tumors, such as nasopharyngeal carcinoma, and lung carcinoma,, the expression of pIgR is decreased. However, the expression of pIgR in endometrial adenocarcinoma remains undefined. In this study, we tested the expression of pIgR by IHC in 70 endometrial adenocarcinoma tissues. The expression level of pIgR in endometrial adenocarcinoma (96.1%) was significantly higher than those in other endometrial tissues including normal endometrial, simple hyperplasia endometrial, complex hyperplasia endometrial, and atypical hyperplasia endometrial tissues. The H-score of pIgR was the highest in endometrial adenocarcinoma out of the endometrial tissues tested. This result was consistent with the findings in the upper gastrointestinal tract and hepatocellular carcinoma., Studies have shown that some malignant human tumors could produce Igs that participate in regulating antibody-mediated cell cytotoxicity. This indicates that some Igs may be related to the growth of tumor cells., PIgR is associated with the secretion and degradation of Igs,, and it is speculated to play roles in the growth of malignant human tumors by regulating the secretion of Igs, or cancer might lead to the increase in the expression of pIgR. The high expression level of pIgR in endometrial adenocarcinoma is likely due to cancer stimulating the upregulation of pIgR. To the best of our knowledge, the correlations between pIgR and the histopathological characteristic of tumors are still inconsistent. Berntsson et al. reported that pIgR was significantly associated with lower grade epithelial ovarian cancer and that high expression of pIgR predicated better prognosis. Fristedt et al. also found that in patients with pancreatic cancer, high pIgR expression was associated with the more favorable phenotype, while low expression of pIgR predicted worse survival. Another study suggested that the lack of pIgR was associated with more frequent lymph node metastasis and more invasive adenocarcinoma of the distal esophagus and gastroesophageal junction. In our study, there were three pIgR-negative cases, all of which were low clinicopathological grade tumors with superficial muscular infiltration and without lymphatic metastasis, distant metastasis, or vascular carcinoma. However, there were no significant correlations between pIgR expression and the FIGO stage, depth of invasion, lymphatic metastasis, tissue transfer, vascular involvement, and tumor grade in endometrial adenocarcinoma. This result was consistent with Wang et al. 's research results. In Ocak et al. 's study, pIgR also showed no association with lung cancer stage and survival. The limitation of our study is the lack of research about the correlation between pIgR and survival in patients with endometrial adenocarcinoma. PIgR can promote the initiation of certain tumors and inhibit other tumors. To determine how pIgR affects endometrial cancer progression, we studied the migration and proliferation of endometrial adenocarcinoma cells after downregulation of pIgR. Our study revealed that the downregulation of pIgR promoted the migration of endometrial adenocarcinoma cells, suggesting that pIgR might play a role in inhibiting cancer cell invasion. This result was different from those of some previous studies. Research showed that pIgR could promote the transformation and proliferation of hepatocellular carcinoma cells, which implied that targeting pIgR has therapeutic potential. Another study found that downregulated expression of pIgR in pancreatic ductal adenocarcinoma led to the reduction of cancer cell proliferation and invasion, and low pIgR scores resulted in a trend toward better survival. These results implied that pIgR was perhaps a tumorigenic factor. Another study found that overexpression of pIgR could inhibit the proliferation of lung cancer cells. In our study, there was no significant difference in the proliferation of endometrial adenocarcinoma cells before and after downregulation of pIgR. Our findings revealed that pIgR might be a potential predictive biomarker of endometrial adenocarcinoma and is a candidate target protein for immunotherapy in patients. However, the association between pIgR and the long-term prognosis of patients with endometrial adenocarcinoma needs further study, and more research with a wider array of patients needs to be performed. This research was supported by the Foreign Cooperation Projects of the National Ministry of Science and Technology (2012DFR30490). Johansen FE, Kaetzel CS. Regulation of the polymeric immunoglobulin receptor and IgA transport: New advances in environmental factors that stimulate pIgR expression and its role in mucosal immunity. Mucosal Immunol 2011;4:598-602. Moon C, VanDussen KL, Miyoshi H, Stappenbeck TS. Development of a primary mouse intestinal epithelial cell monolayer culture system to evaluate factors that modulate IgA transcytosis. Mucosal Immunol 2014;7:818-28. Armitage CW, O'Meara CP, Harvie MC, Timms P, Wijburg OL, Beagley KW, et al. Evaluation of intra- and extra-epithelial secretory IgA in chlamydial infections. Immunology 2014;143:520-30. Kortum AN, Rodriguez-Nunez I, Yang J, Shim J, Runft D, O'Driscoll ML, et al. Differential expression and ligand binding indicate alternative functions for zebrafish polymeric immunoglobulin receptor (pIgR) and a family of pIgR-like (PIGRL) proteins. Immunogenetics 2014;66:267-79. Nguyen TT, Baumgarth N. Natural IgM and the development of B cell-mediated autoimmune diseases. Crit Rev Immunol 2016;36:163-77. Xu S, Ma L, Evans E, Okamoto CT, Hamm-Alvarez SF. Polymeric immunoglobulin receptor traffics through two distinct apically targeted pathways in primary lacrimal gland acinar cells. J Cell Sci 2013;126:2704-17. Kato-Nagaoka N, Shimada S, Yamakawa Y, Tsujibe S, Naito T, Setoyama H, et al. Enhanced differentiation of intraepithelial lymphocytes in the intestine of polymeric immunoglobulin receptor-deficient mice. Immunology 2015;146:59-69. Iovino F, Molema G, Bijlsma JJ. Streptococcus pneumoniae interacts with pIgR expressed by the brain microvascular endothelium but does not co-localize with PAF receptor. PLoS One 2014;9:e97914. Richmond BW, Brucker RM, Han W, Du RH, Zhang Y, Cheng DS, et al. Airway bacteria drive a progressive COPD-like phenotype in mice with polymeric immunoglobulin receptor deficiency. Nat Commun 2016;7:11240. Fristedt R, Gaber A, Hedner C, Nodin B, Uhlén M, Eberhard J, et al. Expression and prognostic significance of the polymeric immunoglobulin receptor in esophageal and gastric adenocarcinoma. J Transl Med 2014;12:83. Chang Y, Lee TC, Li JC, Lai TL, Chua HH, Chen CL, et al. Differential expression of osteoblast-specific factor 2 and polymeric immunoglobulin receptor genes in nasopharyngeal carcinoma. Head Neck 2005;27:873-82. Khattar NH, Lele SM, Kaetzel CS. Down-regulation of the polymeric immunoglobulin receptor in non-small cell lung carcinoma: Correlation with dysregulated expression of the transcription factors USF and AP2. J Biomed Sci 2005;12:65-77. Ai J, Tang Q, Wu Y, Xu Y, Feng T, Zhou R, et al. The role of polymeric immunoglobulin receptor in inflammation-induced tumor metastasis of human hepatocellular carcinoma. J Natl Cancer Inst 2011;103:1696-712. Siegel R, Ma J, Zou Z, Jemal A. Cancer statistics, 2014. CA Cancer J Clin 2014;64:9-29. Ballester M, Bendifallah S, Daraï E. European guidelines (ESMO-ESGO-ESTRO consensus conference) for the management of endometrial cancer. Bull Cancer 2017;104:1032-8. Liu SP, Cheng XW, Tian X, Zhang Q, Cui HY, Hua KQ, et al. Laparoscopic surgery for endometrial cancer in aged patients: Experience from a tertiary referral center in Eastern China. J Cancer Res Ther 2017;13:761-6. Jung J, Kim YS, Joo JH, Park W, Lee JH, Kim JH, et al. Oncologic outcomes after adjuvant radiotherapy for stage II endometrial carcinoma: A Korean radiation oncology group study (KROG 14-10). Int J Gynecol Cancer 2017;27:1387-92. Ruiz MP, Huang Y, Hou JY, Tergas AI, Burke WM, Ananth CV, et al. All-cause mortality in young women with endometrial cancer receiving progesterone therapy. Am J Obstet Gynecol 2017;217:669.e1-69.e13. Yue X, Ai J, Xu Y, Chen Y, Huang M, Yang X, et al. Polymeric immunoglobulin receptor promotes tumor growth in hepatocellular carcinoma. Hepatology 2017;65:1948-62. Qi X, Li X, Sun X. Reduced expression of polymeric immunoglobulin receptor (pIgR) in nasopharyngeal carcinoma and its correlation with prognosis. Tumour Biol 2016;37:11099-104. Ocak S, Pedchenko TV, Chen H, Harris FT, Qian J, Polosukhin V, et al. Loss of polymeric immunoglobulin receptor expression is associated with lung tumourigenesis. Eur Respir J 2012;39:1171-80. Qiu X, Zhu X, Zhang L, Mao Y, Zhang J, Hao P, et al. Human epithelial cancers secrete immunoglobulin g with unidentified specificity to promote growth and survival of tumor cells. Cancer Res 2003;63:6488-95. Li M, Zheng H, Duan Z, Liu H, Hu D, Bode A, et al. Promotion of cell proliferation and inhibition of ADCC by cancerous immunoglobulin expressed in cancer cell lines. Cell Mol Immunol 2012;9:54-61. Michaelsen TE, Emilsen S, Sandin RH, Granerud BK, Bratlie D, Ihle O, et al. Human secretory IgM antibodies activate human complement and offer protection at mucosal surface. Scand J Immunol 2017;85:43-50. Braathen R, Sorensen V, Brandtzaeg P, Sandlie I, Johansen FE. The carboxyl-terminal domains of IgA and IgM direct isotype-specific polymerization and interaction with the polymeric immunoglobulin receptor. J Biol Chem 2002;277:42755-62. Berntsson J, Lundgren S, Nodin B, Uhlén M, Gaber A, Jirström K, et al. Expression and prognostic significance of the polymeric immunoglobulin receptor in epithelial ovarian cancer. J Ovarian Res 2014;7:26. Fristedt R, Elebro J, Gaber A, Jonsson L, Heby M, Yudina Y, et al. Reduced expression of the polymeric immunoglobulin receptor in pancreatic and periampullary adenocarcinoma signifies tumour progression and poor prognosis. PLoS One 2014;9:e112728. Gologan A, Acquafondata M, Dhir R, Sepulveda AR. Polymeric immunoglobulin receptor-negative tumors represent a more aggressive type of adenocarcinomas of distal esophagus and gastroesophageal junction. Arch Pathol Lab Med 2008;132:1295-301. Wang X, Du J, Gu P, Jin R, Lin X. Polymeric immunoglobulin receptor expression is correlated with poor prognosis in patients with osteosarcoma. Mol Med Rep 2014;9:2105-10. Arumugam P, Bhattacharya S, Chin-Aleong J, Capasso M, Kocher HM. Expression of polymeric immunoglobulin receptor and stromal activity in pancreatic ductal adenocarcinoma. Pancreatology 2017;17:295-302.